Elmer/Ice is a full-Stokes, finite element, ice sheet / ice flow model. The aim of this website is to present the capabilities of Elmer/Ice and to distribute course materials and tutorials. Elmer/Ice is an add-on package to Elmer, which is a multi-physics FEM suite mainly developed by CSC-IT Center for Science Ltd., Espoo, Finland. Initially started by CSC, IGE and ILTS, currently multiple institutions and individuals contribute to the development of Elmer/Ice. The built-in inversion capabilities of Elmer/Ice have been used to determine the change of basal friction coefficients below the glacier at Basin 3, Austfonna, during the acceleration phase of its recent surge. This time series, showing the unplugging of the stagnant ice front, was made possible by a highly temporal and spatial resolved set of satellite observations. Observations also provided information on the crevasse field at the glacier, which was used to compare with the results obtained by the discrete element model, HiDEM, which was used to determine the instantaneous fractures as a reaction to the changing inverted basal friction. Identifying those crevasses that are deep enough to act as a path for surface water towards the bed and using a simplified hydraulic model, the possible mechanisms that lead to the surge of Basin 3 in early 2013 are discussed in this paper. 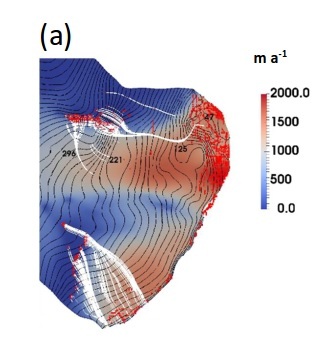 The picture shows the basal sliding velocities computed by Elmer/Ice as well as the flow path according to the hydraulic potential of water entering the deepest crevasses (red dots) that have been computed with HiDEM.